Bringing the joyful grace of early spring, this good sake set comes with a charming sake jug and four matching sake cups featuring the simple and elegant design of spring’s cherry blossom first blooms. In Japanese culture, cherry blossoms are a well loved flower and are admired for their short yet beautiful bloom. A symbol of transient beauty and the fleeting nature of things, cherry blossoms are commonly featured in Japanese arts and crafts. 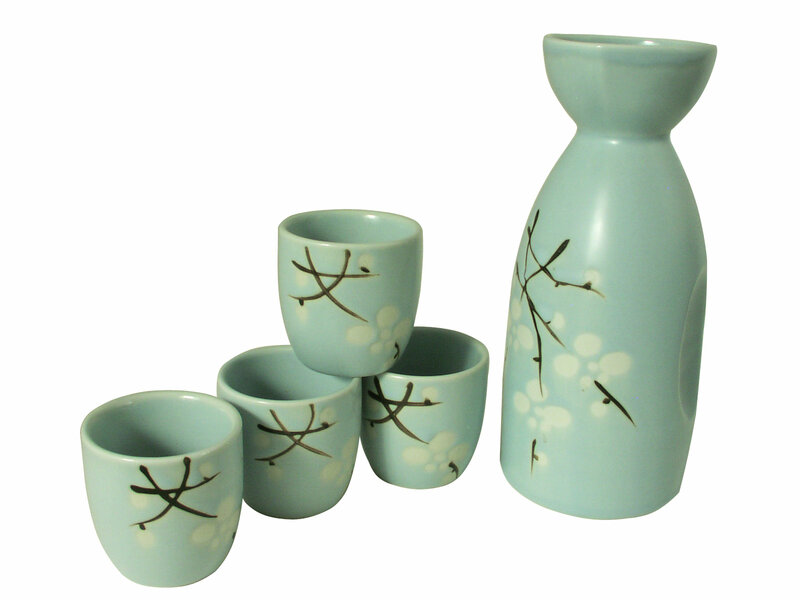 In a pleasant light blue, this good sake set features minimalistic motif of cherry blossoms in white against branches painted in black. Part of the Cherry Blossoms Collection, this sake set is beautifully glazed to a smooth glossy finish. The sake bottle features a wide rim to facilitate the pouring of sake and a graceful cylindrical body. Indented sides allow for easy grip. A perfect gift for sake lovers, this good sake set also makes a wonderful companion to other Cherry Blossom Collection Pieces. Hand wash is recommended for this item.